Learning to fly. On a trapeze. Kristin Conard takes a class in Philadelphia to be the kind of woman who could fly on a trapeze, not one who would just watch. 1, 2, 3, 4…I counted the rungs of the ladder as I climbed. Easier to think about that than about my imminent jump off a platform two stories high. 12, 13, 14, 15. I inhaled on the even numbers and exhaled on the odds, but it did nothing to make my heart beat any slower. 22, 23, 24. Then I was out of rungs with nothing left to distract me. When asked by the Philadelphia Tourism Board which of the events I’d wanted to attend as their guest in this spring’s Philadelphia’s International Festival of Arts, I put as my top choice Fly City a trapeze class. I wanted to be the kind of woman who could fly on a trapeze, not someone who would just watch. 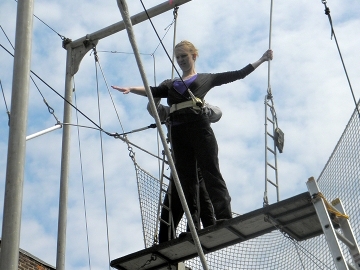 But I didn’t think through that by signing up for Fly City, I would actually have to fly on a trapeze. Swing through the air, if not with grace, then without losing consciousness out of fear and cowardice. The morning of the class was windy. As I walked there, a part of me thought that perhaps it might be nice if it was too windy, forcing them to cancel class. Then not flying wouldn’t have been because I chickened out. No such luck. One of the more advanced students. Photo courtesy of the author. 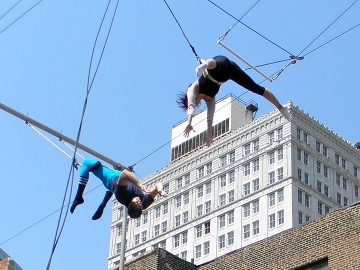 In an empty lot between two buildings, a trapeze rig was set up behind a fence. I hesitated at the entrance, and saw a young girl around 8 years old with her mother. OK, Kristin. If she can do it, you can do it. Though really, I wasn’t 100% convinced of this truism. She’s too young to be afraid, I thought instead. When I ski, I preemptively fall down to prevent myself from biting it. Heights and uncontrolled speed, especially in combination with each other, are both on my list of things that I tend to actively avoid. This may be why my main sports-related activities are hiking and running–both close to the ground with few chances for going too fast, particularly in the flatlands of Kansas, where I grew up. Mary Kelly, owner of Fly School Circus Arts and the head teacher, handed me a waiver to sign. I scrawled my signature at the bottom of the page and handed it back. “Anyone ever throw up?” I asked, laughing a bit to make it sound like I was joking. “That’s why there’s holes in the net,” said Caitlyn, another of the instructors, all of whom seem impossibly relaxed compared to how I was feeling. If she knew I was being serious, she wasn’t letting on. “How you doing?” asked Paul, the instructor on the platform. I looked at him as I held tightly to the guide rope. He went through what I should do, reminded me that when he said “hep,” I had to jump. I nodded and eyed out the bar. It seemed very far away and the net below even farther. I shivered with cold, fear, and adrenaline as Paul hooked my belt into the safety wires. It was a 2-hour class, yet I was up on the rig only 15 minutes after it started. Mary Kelly had first taken our class to the practice area, where we took turns hanging from the bar, hooking our legs over, and then hanging by our knees. And then, with an even shorter lesson on letting go, we were deemed ready. Getting ready. Photo courtesy of the author. Don’t embarrass yourself, don’t die, don’t vomit, don’t pass out. I wondered what would happen if I just didn’t jump. Her next command required me to hook my knees on an upward swing. On the downward swing, she yelled, “Ready, let go now!” I was supposed to let go of my hands and hang upside down. Nope. Not going to do it. Last Trick of the Day – the Catch from Kristin Conard on Vimeo. So I did, and my world flipped. I didn’t slip off the bar, vomit, or pass out. I swung upside down, and ended my flight to applause from my classmates as I did a backflip into the net. But I stifled the urge, and instead just grinned, knowing that at least in this one small way, I am the woman that I wanted to be. 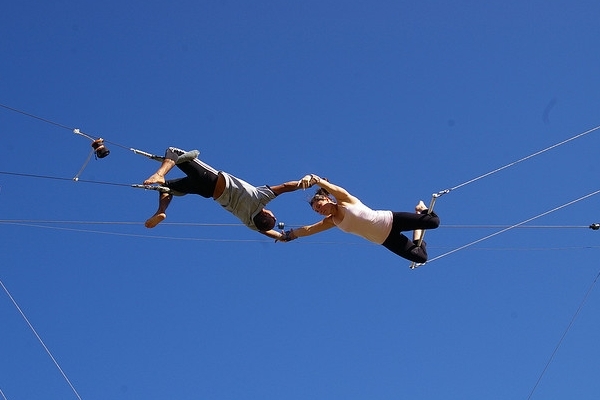 Find out more on trapeze and its history on Matador Life.